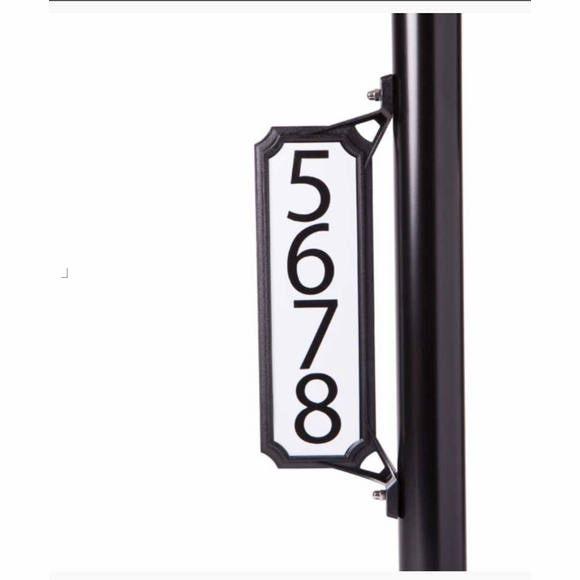 Curbside Mailbox House Number Plaque - - mounts vertically to the side of a wood or metal post or pole or horizontally on the top of a mailbox, fence, gate, or wall; or above a doorway. Horizontal sign can hold up to five numbers. Vertical sign can hold up to 4 numbers. Double sided black address plaque made of ABS plastic. Highly visible reflective backing provides increased contrast at night. Plaque ships with two sets of adhesive numbers for do-it-yourself application, stainless steel hardware, adhesive squares, and detailed instructions (shown in small images above). DIY Hint to Apply Numbers Stickers Straight and Evenly, Every Time! Use a clear ruler and lightly stick the lower part of your number stickers onto the ruler�s edge using the ruler marks as your guide to space the numbers evenly. Let the upper portion of the letters stick out the top. Set the ruler down and use your finger to press the top of each sticker down in place on the reflective tape. When all the stickers are secure, carefully remove the ruler and press the bottoms of the stickers in place with your finger. Plaque can be installed with either the adhesive squares or screws. Adhesive squares do not require any drilling and are best best when attaching plaque to clean smooth surfaces like painted metal. Screws, which require drilling, are best for a more secure installation. Dimensions (interior): 9"W x 2.5"H.